The blog's content also reflects increasing interest in British-made menswear. I have appeared in the FT's How To Spend It magazine as a leading menswear influencer. For more on the blog's press coverage, see Press. Grey Fox Blog attracts up to around 12,000 unique users and up to around 40,000 pageviews monthly (Google Analytics). I post on the blog approximately 2/3 times a week and several times a day on Instagram and Twitter. I use Facebook, Tumblr and Pinterest less frequently. Around 1 in 5 blog readers and Instagram followers is female. Investec Bank (The Investec Derby) AMG Mercedes, Aston Martin, Marks & Spencer, The Guardian, eBay UK, Specsavers, Mr Porter, Hackett, Loake, Pantherella, Holdall & Co, Penhaligon's, Cheaney, Private White VC, Harvie & Hudson, Hawes & Curtis, Billingham bags, Peregrine, Exclusive Tailoring, Artefact London, Age of Reason, Jacamo, Turnbull & Asser, Johnstons of Elgin, Realm & Empire, D R Harris, Jo Malone, Land Rover, Tusting, House of Fraser, Spoke, Black.co.uk, Cravat Club, Scotland Shop, Fraser Knitwear, The Daily Telegraph, Remington, Jigsaw, David Clulow, Hardy Amies, IWC Watches, Mazda, McCann Bespoke, Moss Bros, Dege & Skinner, New & Lingwood, Thomas Pink, Barker, Oliver Peoples, Farlows, Musto, Glenfiddich, The Balvenie, The Crown Estate (St James's), Vulpine, Shackleton, The Park Tower Hotel, Woveninthebone and many others. For more information, see below. I welcome products and brands to feature on the blog and social media. When reviewing products, I give an honest and independent view to my readers, giving you the chance to deal with any concerns before publication. Product reviews and brand features are accepted and written on this express understanding in order to preserve the blog's independence. Please note that I have to be selective in accepting products and brands to feature to allow me to keep on top of the workload and to preserve the blog's focus. Blog costs, both financial and in terms of my time, have been mounting and I ask for a modest charge for being featured here and social media. Exceptions or reductions may be made for start-ups and projects of particular merit and interest. Contact me here greyfoxblog@gmail.com for more information and my Media Pack. I offer photoshoots, collaborations, advertising or sponsored posts (see below). I appreciate that different brands have different budgets; you don't have to be a large business to have your products featured - please ask for my Media Pack (above). I receive so many unsolicited queries about guests posts that I'm afraid I cannot answer them all: I do not accept guest posts as these are invariably by writers paid by brands to gain access to this blog's following. However, if you are a blog reader who would like to write something for the blog please get in touch; I've welcomed such contributions in the past. If I am paid for a post I will mention this by describing the post as 'sponsored', 'a collaboration' or some similar formula which makes it clear that I've received payment. Where I've been sent a product for review this will be made clear in the text. I accept commissions to write for others, here or elsewhere. I've written articles on style for the 40 plus man, lifestyle, Made in UK menswear in the national press, blogs and websites - see Press above for more information. I also speak about blogging, menswear and the made in Britain movement. 'We had a nice uplift in ... sales when you did your blog. 15.7% of our web hits in Feb were from your blog. If I change the Feb date range to 18th Feb to the end of Feb, then 27% of our web traffic was down to you'. 'Hi David. As requested, performance stats for ... referrals for March so far. Once again the biggest external referral to the site'. After much thought I've decided, at the kind suggestion of a Grey Fox reader, to add a donate button to enable anyone who wishes to contribute to my costs of running the blog - travel, time, purchases all make this a costly, albeit enjoyable but unpaid, occupation. My principle wish is that you enjoy the blog. I don't want anyone to feel under any obligation to donate; give only if you feel able to do so. All donations will be spent running the blog, researching, travelling, buying products where necessary. You may make donations through Paypal. Please pay to greyfoxblog@gmail.com and select payment in £sterling to 'friends and family' rather than payment for goods and services. (Note: I have removed the Paypal payment button because it only allowed payment in US dollars). So glad I found your blog. I am 63, run triathlons, ski, swim and feel like I'm still 20. Your photos are great, some indication of the maker or style name associated with the photos would help. Your blog has been a ray of light, I am 49 and had been dressing by default in t-shirts and jeans wanting to change but terrified of going down the beige cardigan route. The blog has given me the direction I was looking for. Very same as Eddie said. Hello Eddie. What a lovely comment Eddie - it really encourages me - you're clearly at the point I was just two years ago - good luck. Thank you Des. I very much appreciate such comments. This is my blog and, apart from some guest posts, is the work of one man. It demands enthusiasm, as it's not a paid job, so such comments fuel the desire to continue. Finally a blog that speaks to me, a guy nearing 50. Splendid job on all accounts. Thanks so much for your much needed blog..
John, you make a good point and I'll answer it in full in a blog post in a week or two - keep an eye on the blog. Thank you Dabbler56; your comments are much appreciated. Good luck in your search for style - keep in touch with any ideas or discoveries. Hello Grey Fox, Dee and Allan here from New Zealand.....oh dear poor little NZ, well we are catching up.....slowly, it's almost 1954 here now ! We discovered your blog and Love it, being where we are has been a challenge, but thank god we are catching up to the rest of the world, returning to beautiful classic styles, Brogues, tweed, suits, blazers and on it goes, while we have lost our hair, but retain our beards, age has become a blessing as we now have a few more style options instead of wearing what 20 something's throw on, we lean towards a more formal style. Thanks to you and a few great Men like you, awareness is being raised in our neck of the woods and Men are starting to look like men again, a tad rugged, stylish and handsome. Once again, many thanks for all your comments. I really appreciate hearing from you. Please don't hesitate to e-mail me with thoughts or questions. Great blog. Any help british men can get in dressing well is welcome as the majority look like they got dressed in the dark. I agree with the earlier comment regarding price as most well made clothes are geared towards those with deep pockets but it is still possible to look good on a budget by always buying classic and not "on trend" items. A good barber is essential too and always splash out on shoes, they will pay you back tenfold. Hello johncs2012, a very interesting question. Would you like to e-mail me and I'll respond that way, possibly with a blog post, but it's hard to deal with as a comment here. I love the Blog your clothing choices and your opinions interesting and thought provoking. Just one small caveat, however. I am 6 feet, 2 inches tall, take size 14 shoes and have a large frame. Perhaps you could encourage manufactures to cater for the larger, older man . I have to buy shoes from Barkers or by mail from the USA and often find that beige or lovatt are the buyer's choice for larger chaps. Time to end this sizeist discrimination? I hope this isn't out of place, but I found a British company yesterday (see link below) selling and, as far as I can gather, making belts from Darlington - including the suede belts I've been after for so long that could solve my First World problem. I'm nothing to do with them and haven't even ordered yet but they seem to be the sort of people of interest to you. I've enjoyed your blog for a long time and would also like to take this opportunity to wish you a very happy and healthy 2017 from Germany. I stumbled upon this most wonderful blog via an interview you did for Gentleman's Gazette. I can't tell you how refreshing it is to have a place for us older men to go and get sartorial advice and ideas. I am 57 and your blog is simply superb! Thank you! Really enjoyed reading your stuff. very interested in the way that many men a really concerned with the way they look. Brilliant!! I am 66 and at the uniform end of the spectrum. Always buy Paul Smith, Carhart, John Smedley Edwin jeans, Italian shoes and Church brogues. In Australia their is no need for heavy clothing. So I often wear shorts,any suggestions on a good brand that makes t-shirts with high neck lines. Currently I only see the looser nect fits that expose my hairy neck!! Fergus, still a mod at 66! I have followed your blog for several years. Like many men my age (58) I find it difficult to find the styles in which I feel comfortable and confident and as you have pointed out many times the industry doesn’t quite know how to deal with us. Work is easy because I wear suits and Oxfords, but the weekends are challenging! We have just lost an excellent independent shop in Winchester that sold an eclectic mix of clothes including brands like Gant, Hartford, RM Williams which are the staples of my wardrobe. Whilst the online retailers will fill the gap, one misses the opportunity to try on lots of things in a shopping session. There are few if any retailers that have carefully curated clothes for geezers like me. Approaching 60, I don’t want to descend into a style wilderness of cavalry twill trousers, Velcro strap shoes and clothes bought from the retailers who advertise in the pages of the telegraph magazine. On the other hand I don’t want to look ridiculous in younger men’s clothes. I do expect to be wearing my Lewis Leathers Cyclone jacket, RMs and all of my other staples for many years to come thanks to your inspiration. Hello Boomer. Sadly many brands do market good classic stuff suitable for all ages, but they use teenage models to sell it (OK I exaggerate a little) so they miss out on a large and fairly well-off market, the older man. Look out for classic stuff, keep trying, try the brands I feature and it will come. I adore your Blog.I am 73 and like good quality clothing. 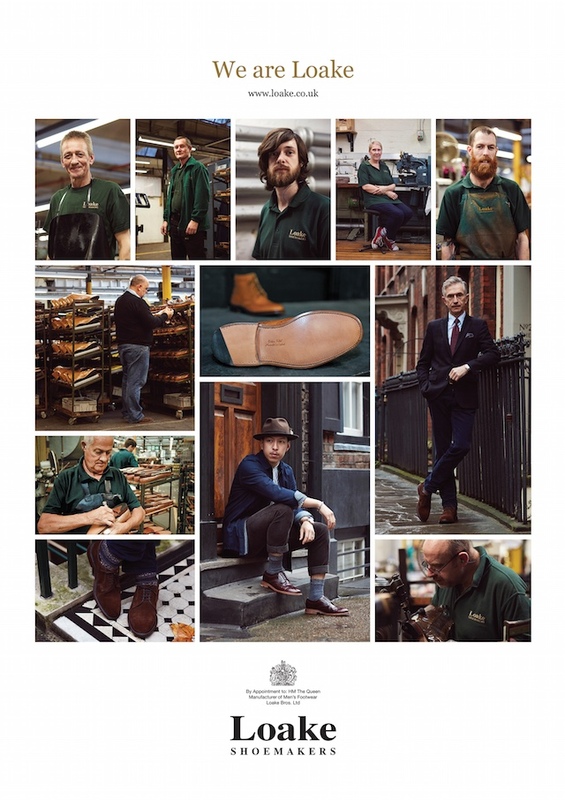 I have several pairs of Loake,Cheaney and Crockett and Jones shoes.All from their factory shops here In Northamptonshire.Have you tried some of them ? Thanks Will - I've written about Barker, Crockett & Jones, Loake and others on the blog over the years.